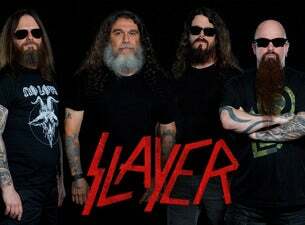 Formed in 1982, Slayer became one of the most successful thrash metal bands of the 1980s and 90s. The band released debut LP Hell Awaits in 1985, winning them an army of devoted fans with its macabre subject matter and devestating guitar solos. Def Jam founder Rick Rubin signed the band to his label and produced the classic follow up Reign in Blood, still regarded as one of, if not the definitive speed metal album. Since then, the band have continued in the same vein with South of Heaven, Seasons in the Abyss, Divine Intervention and Diabolus in Musica plus double live album Decade of Aggression.